Looking for somewhere to get a meat-free meal in Toronto? Look no further than these spots that serve some of the best vegetarian and vegan food in the city. Tucked away in Baldwin Village Vegetarian Haven serves comforting, flavourful Asian-inspired vegan cuisine. Local and organic ingredients are used whenever possible and the extensive menu covers everything from soups and salads, to wraps, curries and noodle dishes. Some of the best options include the tofu drumsticks made from crispy seitan, and the miso dumpling souper bowl packed with veggie dumplings, rice noodles and mushrooms. They also serve organic fresh pressed juices, organic kombucha blends and smoothies with almond milk. There’s a charming patio for when the weather warms up. You can’t have a list of Toronto’s best vegetarian restaurants without including Fresh. With four locations across the city and a legion of longstanding fans (both vegetarian and non-vegetarian alike), this place draws crowds for a reason. Food is tasty, colourful and comes to your table quickly. First opened in 1999, Fresh gave Toronto a new perspective on vegetarian food, namely that it could be just as tasty as it was healthy. Rice and noodle bowls, salads, sandwiches, wraps and hearty burgers make up the majority of the menu and you can also get fresh pressed juices, smoothies and power shakes. Kensington Market’s tiny Hibiscus Café serenely serves up some of the city’s tastiest vegetarian food. Everything on the menu at this family run operation is also gluten free and they’re known for their buckwheat crepes that come with a variety of sweet or savoury fillings. Soup, salad and homemade vegan, soy-free desserts round out the menu. Hibiscus is famous for their dairy-free ice cream, which you can get served in a gluten-free cone. This colourful spot at Dupont and Spadina has been serving creative meat-free, sometimes raw, vegan meals sans gluten or sugar for more than a decade. 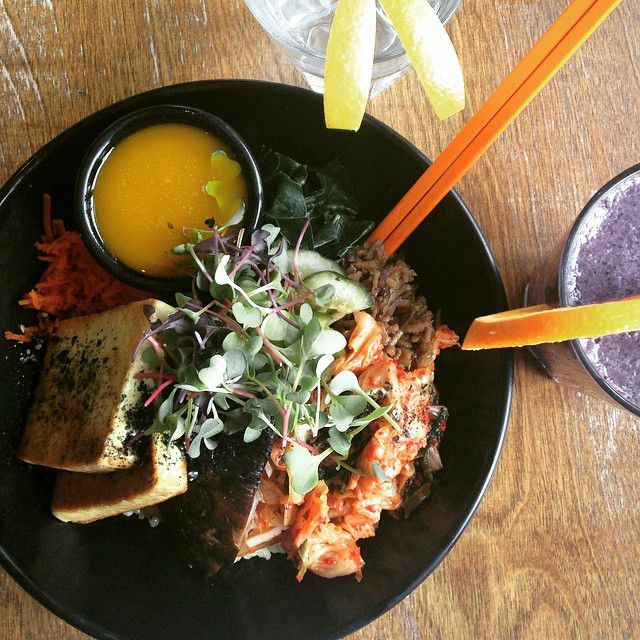 The menu is varied, featuring salads, wraps, burritos, burgers, rice (or quinoa) bowls and raw mains. One of your best bets is the raw combo which lets you sample several of the raw items. But no matter what you get here, flavours are bright and veggies are plentiful. They also have an extensive list of juices and smoothies, as well as a cocktail menu. In the summer, try and nab a seat on the cute back patio. There are three Urban Herbivore locations in Toronto and at each one you can expect, fresh, fast and flavourful vegetarian fare. Everything you get is made from scratch and is free of preservatives, additives, or, as they describe in their philosophy, “ingredients you can’t pronounce”. All of their packaging is 100 percent biodegradable and they use local, organic ingredients whenever possible. The menu is broken down into soups, stews, sandwiches and custom built salad and grain bowls. Fresh pressed juice and baked goods are also available. Brought to you by the Chase Hospitality Group and Chef David Lee, Planta is (as the name suggests) a plant-based eatery. Everything on the innovative vegan menu is made without the use of any animal products and the stylish setting makes this a great option for anyone looking for an upscale veg-focused meal. Choose from a variety of colourful salads and vegan pizzas, as well as appetizers and mains that make vegetables the star. There are several locations of this fast-casual plant-based restaurant serving up wholesome and healthy fare. Almost everything they serve is made in-house, from sauces to pickles to curries and the bulk of the menu is made up of rice bowls packed with veggies, greens, plant-based proteins and flavourful sauces. They also offer smoothies and smoothie bowls for quick yet energizing breakfasts. If you're craving comfort food but don't want that comfort food to contain animal products, Hogtown Vegan is the place to be. The cozy spot serves up items like burgers, mac and cheese and poutine - all sans meat, dairy, eggs or any other meat products. Even lifelong carnivores are usually won over by big flavour and innovative takes on dishes normally based around meat.